Happy Monday! I love celebrating the wedding anniversaries of family and friends with a hand made card. This year I am using the Sweet Soiree Specialty Designer Series Paper and the Sweet Soiree Embellishment kit. These two items will be retiring at the end of the month. If you wish to purchase them, you need to order soon! 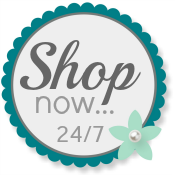 You can use my Online Store. You can see my sentiment is from the *new* Itty Bitty Greetings stamp set. It's wonderful and reminiscent of the retiring Teeny Tiny Wishes. I used Stampin' Blends to color on the back of the Vellum accent flowers from the Sweet Soiree Embellishment Kit. That gorgeous Marina Mist velvet ribbon is behind the cake accent. See the tiny pearl? That is from the *new* Share What You Love Artisan Pearls. Thanks for looking today! I hope you are inspired! Please come back again soon.